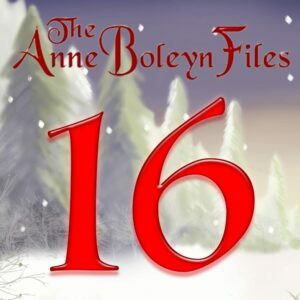 Sunday is traditionally the day of rest, so sit back and enjoy today’s treat from the Anne Boleyn Files Advent Calendar. Thank you so much to historical novelist Janet Wertman for contributing today’s Tudor treat. We’re so lucky this year to have had so many contributions from authors, historians and bloggers in the world of Tudor history. I do hope you enjoy Janet’s contribution as much as I did. To enjoy today’s treat – and the other 15! – simply click on the number 16 here or scroll to the top of the website and click on the Advent Calendar link in the cover image – easy! also given her the greatest gift he could – he had elevated her to queen but now he was disenchanted, the Seymour’s were in the ascendant, Jane was older than the average noblewoman when she wed the king, and it was something she must have been rather embarrassingly aware, there is no record of her father making marriage plans for her so what had gone wrong, her younger sister was married before her and I do not mean to sound unkind, but possibly her parents did not think any man would marry her, she was not known for her beauty and she did not seem to possess much of a personality either, but to the high born Tudor families of the day marriage contracts were made when the children were young it was made between the two families of the intended, and money power and titles were taken into account, so why was Jane still unmarried at 27? When King Henry showed a preference for her company her parents must have been amazed and full of joy, they had a chance to get rid of her, really though she had something about her which Henry found soothing and peaceful, there were no angry tirades from Jane no outbursts of temper, Henry found her calming and maybe she was just what he needed, I wonder why they exchanged gifts on the new year instead of on Christmas Day, by tradition our queen possibly from her own father has the present giving on Christmas Eve, maybe it was started by Queen Victoria, I suppose Bq knows? Gifts were traditionally given on 26th December as Christmas Day was a day of fasting and going to Mass. You had a special Mass of the Nativity at Midnight on 24/25th and then your Christmas meal because you had to fast all day before Mass. In some traditions, Epiphany was when gifts were given as this was when the the Magi gave gifts to Jesus. In the Christian Calendar Lady Day or 25th March was the New Year but the Tudors celebrated it on 1st January and gave gifts then instead as part of the 12 Days of Christmas. There are variations in the way Christmas and New Year are celebrated today in different countries and in France they give presents at New Year. Sorry I have no idea why they changed it, save that they felt it made more sense, probably. Thanks Janet for the exert from your book. I think it probably captures how Henry changed towards Anne, although I am not certain he was feeling that cold towards Anne because she was pregnant with his son and early in January 1536 after Katherine of Aragon died they had a party. Anne and Henry had been reconciled during the Summer progress. Henry did have a fancy for Jane Seymour but as a mistress and she was playing Henry along as she used her virginity and good morals as a way to keep him interested, but she wanted a husband and Henry knew it well. He also knew he had to woo her so he chose the diamonds and jewellery for her very carefully and he also here doesn’t want to single Jane out in public and then gave her presents in private. Jane, yes, was now getting on a bit for a young gentlewoman to be unmarried and there are a few ideas as to why she hadn’t married. She was about 27 years old, just a few years older than the average age for marriage at this time of 24 for women, even in her class. It was only the upper crust who married their kids of in their mid teens so she wasn’t too out of step. In fact she had been engaged but we don’t know why it was broken off, but her service at Court obviously took precedence over her personal happiness and she had served Queen Katherine before Queen Anne. Henry and Anne had been merry together and had been good together at first but for over a year now relationships between them were not good. She continually nagged him over other women, over his policies and over his preference for Mary still. She had still not given him a son and he was impatient. Now she was pregnant again and they were close again, but it was also Anne’s last chance. Maybe if their relationship wasn’t on and off and they were still happy another miscarriage may not have been so fatal, but Henry had turned cold towards Anne before and hated her nagging. By now she had a great number of enemies who began to form a faction against her and they waited, willing her to fail. Anne had to be very careful and here in this novel we see why. She was only one step away from falling and everything was in the balance. She had to give the King a son or his interest would be lost completely. It is interesting to consider if firstly Henry was only thinking of Jane as a possible mistress, that’s how his fancy with Anne started out, lust was what the attraction was all about, wedding bells no way! Yet after his feelings for Anne grew he did begin to see her as a potential consort but I think with Jane it was different, he was no longer young unlike his courting days with Anne, and so I believe he seriously thought of her as a suitable wife as he began to tire of his troublesome queen, he was now getting increasingly desperate for a son and the Seymours knew that, indeed so did everyone, as the Boleyns star began to fade so did the Seymours glow more brightly, the tale of when Jane returned his purse of coins is famous, enchanted with her modesty and virtue he told himself I dare say, she showed the proper attributes that were required in a queen, she was also from a large family which had several healthy sons, another point in her favour, Janes virtues must have seemed all the greater when he compared her to his sullen barren queen. I never really believed the idea that Henry wanted Jane as his mistress because he was probably aware that she would say no because he knew her family and he knew her from her service to Queen Katherine. He knew that he wanted more than a mistress at this time, because he still needed a son. I see Jane as being a lady that he wanted to court, in a game of courtly love and service and to hold in reserve in case Anne had another daughter. It isn’t actually clear when Jane actually attracted Henry’s attention but she was noted at Court as his possible fancy in January and most definitely by March 1536. A traditional tale has her being noticed when Henry and the Court came to Wulfhall in July 1535 but Anne was with him then. She must have been present when the Court was received by Sir John and her large family and no doubt she was formally presented with them to Henry and Anne and arrangements made for her return to Court. There was friction between herself and the Queen in the months after Anne’s miscarriage because of gifts Henry gave her and because she was moved into the apartments next to the King which used to belong to Thomas Cromwell. Henry, I agree was biding his time with Jane because of the rise of a faction around her family and because he was desperate for a son, but Anne carried his child and he may be blessed with one in the Spring or early Summer. He may have seen Jane as a potential candidate if he decided to remarry because of her family, her lineage and the obvious fertility in that family. He may also have seen something in Jane which gave him comfort, peace and admired her way of gentle order and her apparent obedience. Henry saw something in Jane and asked her leave to serve her. He was getting on now, almost forty five and he was desperate for a son and he was indeed becoming disenchanted with Anne. Jane would prove worthy by her refusal of his letter and purse and her talk of honoured marriage. Anne had done the same with her own virtue and Henry could not resist her offer of herself as his Queen. Jane had watched and learned this and she was ready to drop hints that she would accept an offer of marriage. Henry could bide his time, wait and see how this pregnancy worked out, but if Anne didn’t deliver, he had options, but he didn’t know that the interest in Jane he had at Christmas would turn into a fatal decision to make her his wife. I know that Boxing Day which is as we know the 26th is so called because the gifts given were in boxes, hence Boxing Day, I read that a long time ago about Christmas traditions and when people ask why it’s so called I delight in telling them, we are the only country to have Boxing Day which means another holiday – very nice, unless you are unlucky enough to work in retail in which case you may find yourself working very unsociable hours, in the good old days before shops opened very early and closed late and Sunday opening to, Christmas was a nice little holiday, but then they opened on bank holidays and now some supermarkets are open 24 hours, classed as public holidays the poor staff still have to work, it is interesting the traditions and foods other countries have around the world, in Sweden they have a large joint of ham and they light candles on Christmas Eve and a young child walks around holding a candle in honour of the Christ child,, in Italy they have their own lighter version of our Christmas cake, the Panetonne which I think is absolutely delicious, most countries have Turkey at their feast including some Greek friends of mine, most countries tuck in to a good feast, it was Henry V111 who first introduced turkey to the Christmas table, in his day it must have tasted delicious but you have to buy a young free range bird to get the taste and flavour now, as with chickens the battery farms have ruined the flavour, in Rochester famous for the birthplace of Charles Dickens they hold an annual Christmas Faye with the locals all dressed up in Victorian clothing, some as characters from his novels, Fagin and The Artful Dodger, the cobbled lanes are alive with hot chestnut sellers and they hand out warm spicy punch, there are craft stalls and all the shops are open, I went on a Sunday many years ago and it was a delight, there was a group singing carols and it was like being transported back in time a 100 years ago, it was a very cold day but very enjoyable I do like Christmas craft markets, the only negative thing I remember about Rochester was the lack of seating, you couldn’t really sit down much, and most of the little tea houses were full but it was a great day. Thanks for sharing this information on so many Christmas traditions from around the world. Most interesting. I really enjoyed reading this, thank you for this opportunity. This seems to be the best place to post this. Did anyone see The Truth About Christmas Carols with composer Howard Goodall on Tuesday on Channel Four? I recommend it and here is something funny that he said while talking about how the Tudors went potty at Christmas. He commented that if Christmas was a woman Henry Viii would have married her. He loved the season that much. The documentary is on the download and I Player. He also had a number of experts like Ronald Hutton so it was interesting as a history of the carol and how they transformed from street songs for the community into the Church Choir and services today. Some have a very political background like Come All Ye Faithful which was written by a Jacobite and is code for supporting the King Over the Water and so Bonnie Prince Charlie. It was sung in the Catholic Ambassadors Chapels where Catholics could go in the eighteenth century as they were safe. Most carols were sung to local tunes and many were not suitable for Church so they were kept out and even banned. It was an evolutionary process which led to them coming into the Church in the nineteenth century. Before that you sang them house to house or in the local town or the pub as a community activity or taking alms to the poor. Community choirs introduced them into some churches but even then it was frowned upon. If you watch the programme on demand you may find something interesting out about Cromwell, who didn’t actually ban Christmas and about Cambridge 9 Lessons and Carols which are 100 years old this year. Just seen your post, no I saw this programme in the radio times but didn’t watch it, however I intend to watch it on I player and I just say, what a droll image that conjures up, Henry V111 taking Mrs. Christmas his bride ha! I can’t wait to be able to purchase it! Thank you to every person whom puts their hard work and Tudor knowledge into The Anne Boleyn files! I always read something here that amazes me, plus helps me to further my knowledge and excite my imagination. Lovedlovedloved all these comments and insights (and compliments, I can’t lie!!). What an amazing community the Tudorverse is!